TONIGHT! Monday, April 7th, 2014. Start time 7pm Pacific. This event will be recorded and available on YouTube if you can’t make the live event. You’re invited to join the DG as we attempt to game online via Google Hangouts. 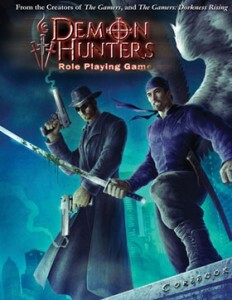 We’ll of course be playing the Demon Hunters Roleplaying Game. We are excited to game, and we’re excited to game with each other, which this group doesn’t get to do much. Hopefully you’ll find it entertaining as well, and if you like the game, maybe hop on over to Paizo and pick up a copy. It’s also available on PDF at DriveThruRpg. Yes, you the audience can take a part in the game. You will be the party’s Cipher. Don Early, the Game Master, will be taking suggestions from the audience similar to Improv, and the audience can control the Cipher, give it commands, etc. You will also be able to fill in some of the information The Cipher gives to the party. Remember, The Cipher is the access to the Brotherhood Database. With the interwebs at your disposal, you can offer places on Google Maps, people, monsters, lore, etc, of course subject to GM approval. Don will explain more when the game begins. Or maybe welcome back. Some of you are familiar with the Demon Hunters story from the movies or the RPG. Forget all that. 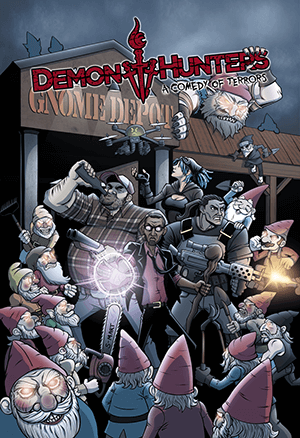 The Demon Hunters comic is a complete re-imagining of the DH universe. We’re taking things back to before the beginning, picking up Gabriel’s story from right after the fallout from the Vancouver Disaster. Along the way you’ll recognize some faces, and encounter a familiar plotline or two, but this is an all new take on the original stories. For the rest of you, hi! You’re in for a treat! I’ve been hooked on Demon Hunters from the very beginning, never imagining that one day I’d be handed the keys to the universe and told to take good care of it. Hopefully I do my job right, and you guys get as obsessed with these characters and this world as I did. We’ve got a plan. The Demon Hunters story has been sketched out from beginning to end. It’s just a matter of reaching that endpoint. We’re starting out as a weekly comic, with updates every Tuesday. At a rate of one page a week, this story’s gonna take a LONG time to tell. If you like what you see, and you’d like to help us get things moving a little quicker, check out our Patreon campaign. As much as we’d love to do Demon Hunters for a living, Ben and I both have full time jobs that aren’t making this comic. Not even close. Maybe someday that can change. Every contribution gets us a little closer to our Milestone Goals, and frees us up to work on the comic more. Your contributions will help add more features to the site, and turn Demon Hunters into a two, or even three page-a-week comic. Every little bit helps! If you like the comic, please share it with your friends. Word of mouth is our most powerful tool. And if you don’t like it, shhhhhh! Keep it to yourself! So welcome to the Brotherhood, friends! You’re in for a hell of a show!